For years, the major powers were trying to develop aircraft thatcould take off and land vertically. There were a number of interesting aircraftbuilt to test various methods. Many of them consisted of the aircraft standingon its tail and then taking off straight up. That was the easy bit. Getting backdown took an incredible amount of skill, especially with the low power of theengines that were being used. The method was eventually written off as aninteresting idea, but not practical. There had to be a way to do it that didn'trequire a huge amount of skill. The next idea was to have the engines themselves rotate from thevertical to the horizontal. This meant that they needed to be on pivots. Mostdesigns had the engines on the ends of the wings. Not really the best place forhigh thrust jets. There were also problems with the pivot mechanisms themselves.Other designs tilted the entire wing to provide vertical or near vertical takeoff. Again, this meant a huge hinge and pivot mechanism as well as otherproblems. The 'move the engines' idea is coming somewhat to fruition with theV-22 Osprey, though it has been a very slow development due to all the newtechnology involved. Another method was to install separate engines for the verticaland horizontal portions of flight. The Dassault company in France had severalaircraft built on this method. Every one of them ended up crashing. The amountof fuel needed as well as the space and weight problems with this kind of anaircraft made it impractical. Eventually, it was Hawker who came up with theideal of just moving the jet exhaust nozzles to give you vertical and horizontalthrust. Trust it to the British to come up with a simple solution to a complexproblem. This aircraft eventually became the Harrier. The only thing that wasstanding in the way of earlier development was an engine of suitable thrust andRolls Royce developed the Pegasus engine that provided more than enough ofthat. The Harrier has gone on to be a very successful aircraft. Oddly,this is the only aircraft of its type to have entered service. The Royal Navyand USMC love the aircraft. It is perfect for the battlefield. No need forrunways, the ability to be near the front lines, an aircraft that can carry adecent ordnance load, and best of all, you don't need to be a test pilot to beable to fly it! The original Harrier GR.1/3, Sea Harrier FRS.1, and AV-8A/C havebeen long out of service, but newer versions have been developed to replacethem. You have heard me say that ESCI kits were either great orhorrible. This one falls into the great category. Though molded in the mid1980s, the kit has engraved panel lines, no flash and very good detailing. ESCIliked to mold a lot of their kits in silver plastic and this one is noexception. Like most kits today, it is built along a semi-modular design so thatseveral other versions can be done using common sprues. Also like many kitstoday, the cockpit instruments are replicated using decals. It is effective forthis scale. The kit has few optional features other than the ability to havethe canopy open or closed. There are sidewinder missiles to hang from wingracks, but they are not very well molded. You also get the underfuselage gunsand a pair of drop tanks. Any bombs will have to come from outside sources. Youcan also pose the speed brake open or closed. Cockpit consists of seat, stick and instrument panel that gointo a cockpit tub. The nose section is separate to allow for differentversions. There is a nicely done compressor face that fits behind the cockpitassembly. You get full intake trunking with all Harrier kits I have ever builtas it really is needed. The exhaustnozzles can be positioned any way that you wish. The landing gear are wellformed and with a bit of surgery you can build the kit wheels up, though thatoption isn't shown. You also have the option of installing the underfuselagecannon or putting aerodynamic strakes in their stead. Instructions are very straightforward and give color calloutswhere needed. The colors are given in FS numbers where appropriate. You have twodecal options. 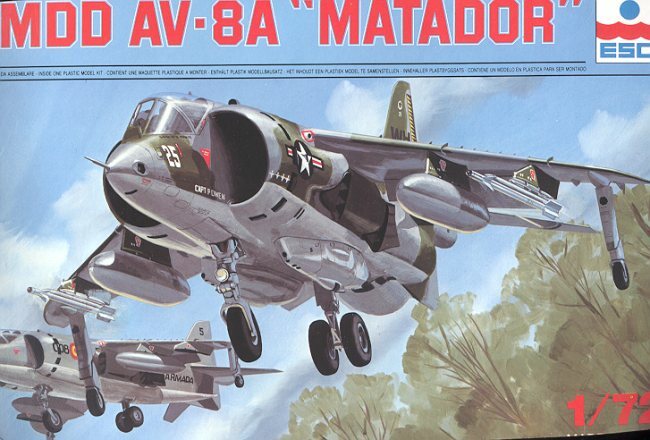 One for a USMC AV-8A and another for a Spanish Matador. The AV-8Ais in the early three color camouflage with colorful rudder markings forVMA-542. The Matador is in gull grey over white. 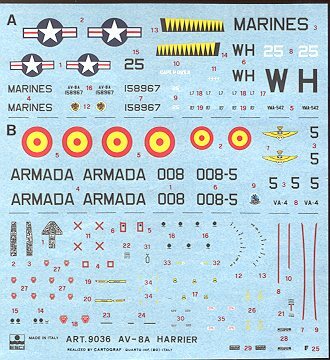 There is a full suite ofstencils and maintenance markings on the sheet as well. If that doesn't suityour tastes, there have been a number of aftermarket sheets for this kit. Overall, it is a superb little kit and well worth seeking tobuild. 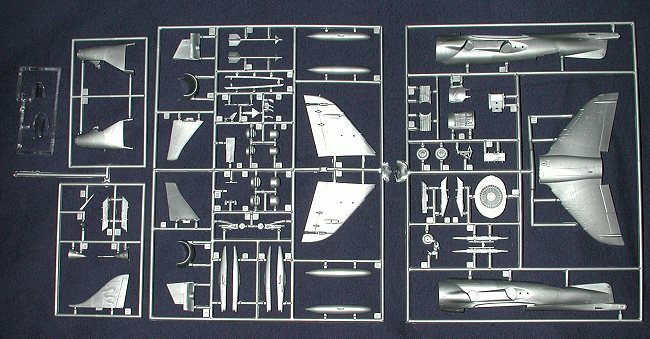 It has been OOP for about ten years, but can be found from time to time.The only other kit that comes up to the same standard is the Fujimi series ofHarriers, also long OOP. If you would like your product reviewed fairly and quickly by asite that has over 1,500 visits a day, please contactme or see other details in the Note toContributors.